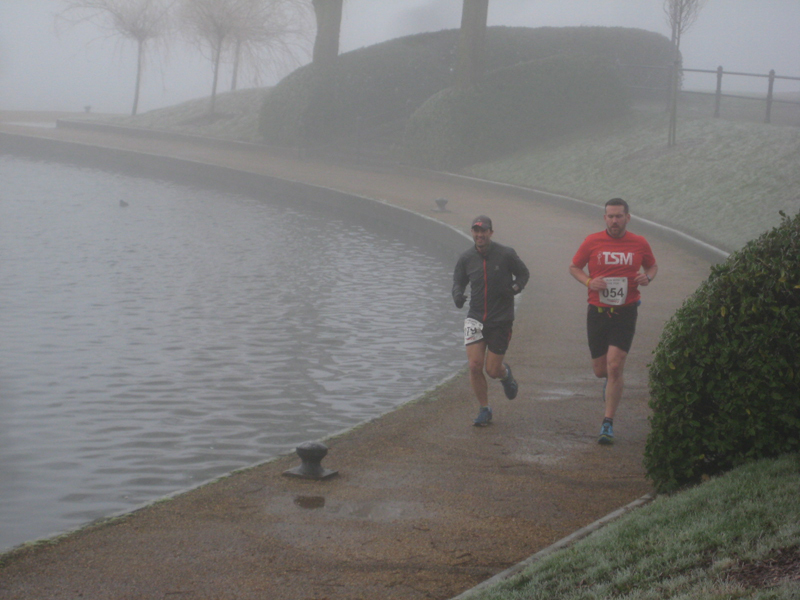 Yesterday saw my first race of the year with a run at the Enigma Winter Marathon. 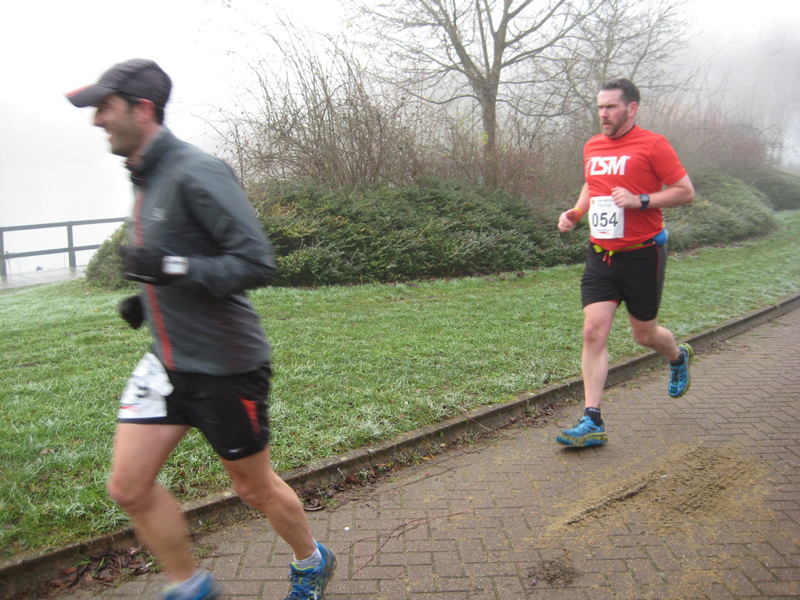 Two marathon events are held that weekend on the Saturday and the Sunday and I was taking part in the Sunday version which involved 7 and a bit loops around Caldecotte Lake near Milton Keynes. I travelled to the event with Fi McNelis and we set our pretty early travelling through a lot of fog and mist before arriving at the event to find the conditions around the course were still icy which meant a proposed delay to the start of the race. Despite waiting an hour for conditions to improve, the cold temperatures all day meant that it would take a while for icy patches around the route to thaw out. The Race Director, Dave Bayley was kind enough to offer runners the option of deferring or running under certain safety guidelines (i.e. take it steady) so I don’t think there could have been any complaints as if you wanted to run you could and if you had a concern over the conditions then you didn’t have to. Out of the 60 odd starters, 22 elected to run which of course included me. The offer to run was appreciated as I wanted to use this as a long training run. Myself, Matt (red) and Fi (blue) at the start. Apparently in all the Enigma Marathons to date they have never had an issue with the weather.. until I arrived with my hat! We set out at 10am and a group of runners headed off. I settled in for a few laps with Matt Brown and we jogged around chatting and catching up until the halfway point when I started to press on. Conditions were a little slippy in places where puddles had iced over and you had to take care on a couple of short wooden bridges which were slick but despite the temperatures feeling cold all day, conditions did improve and I had no issues with my footing during the second half of the race. I had covered the first half of the course in 1.53 which was fine as a planned training run although I was lapped by the leader (Jon) before I had even got half-way! I ran the second half of the race by myself and plugged in the iPod and got my head down and picked up the pace a bit. I ran the second half in around 1.43 so a nice 10 minute negative split. I started to catch up with a few of the back of the pack runners but with only 22 runners on the course you didn’t really see that many people around and I chipped away at the laps until I eventually started catching up with a few of the runners who were ahead of me. I finished in 3.36 which was an ok time but not especially quick but it was a good workout on a cold day. Surprisingly, I had managed to catchup with all the runners ahead and finished 2nd overall but with a very very small field of runners the position was a little meaningless today (apart from the winners). Thanks to Foxy, Karen (who was celebrating her 100th volunteering event) and Cameron for getting the race organised and run today and standing around in cold conditions for hours and hours supporting the small band of runners. Matt finished in about sixth place in 4.19 and Fi trotted home in 5hrs something and we all grabbed a warm drink and wrapped up before heading home. Second marathon completed in two weekends so the long runs for my 2015 ultra’s are well underway. Thanks to Ruth Benzimra for capturing the photos of me.